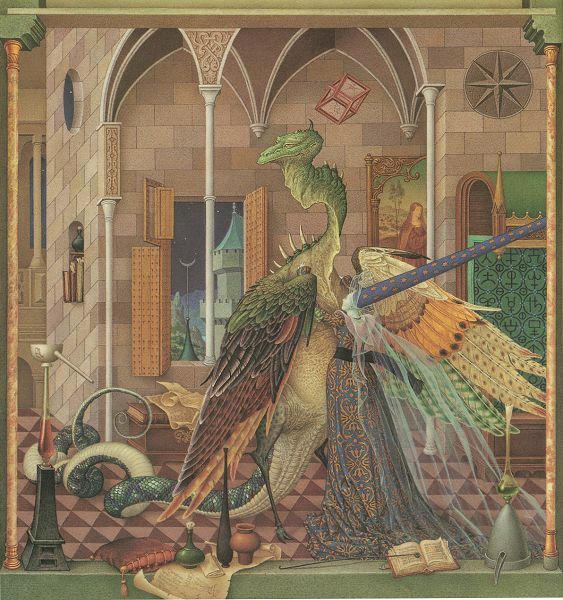 illustrations to "Les Plumes du Dragon"
The images below are illustrations to the fairy tale by Arnika Esterl "Les Plumes du Dragon" illustrated by Olga Dugina and Andrey Dugin. The illustrations are in old medieval style which reminds style of Flemish artist Pieter Bruegel, who painted many scenes of country life. There are some impossible figures were used in the illustrations. 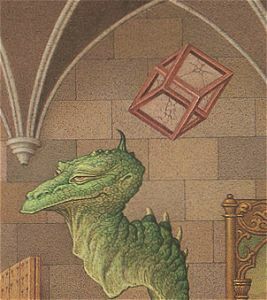 In the image of the Dragon's castle we see the impossible cube over the Dragon's head. 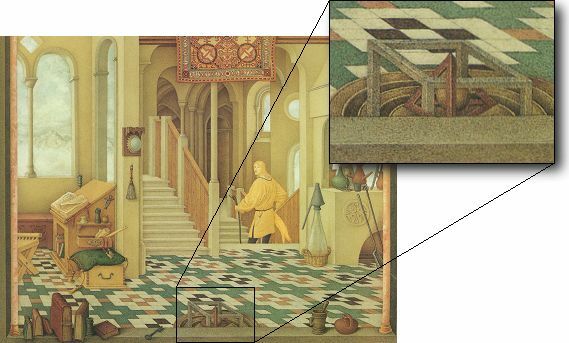 Also we see that column in the room goes to the background behind the castle tower in the window and returns to the foreground. The wall at the left looks inner at the top and outer at the bottom. In the other image we see impossible junction of a cube and a pyramid. Andrej Dugin, who was born in Moscow in 1955, worked as a teacher at the Krasnopenskaya Secondary Arts School. There he got to know Olga Kotikova who was at that time his student. Andrej Dugin studied at the Surikov Arts Institute and worked as an illustrator for Russian magazines and literary publishing houses. By 1984/85 he worked on a Russian animation film as a chief artist. Olga Kotikova (Dugina), who was born in Moscow 1964, studied at the Krasnopenskaya Secondary Arts School. There she got to know Andrej Dugin who was at that time her teacher. She graduated at the Moscow Arts College in 1988 and worked as a designer for a magazine, a cinema and as an illustrator at the Laduga Publishing House. In 1984 Andrej Dugin and Olga Dugina got married. The co-operation with the Verlag J.F. 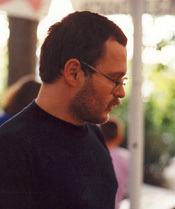 Schreiber, as the Esslinger Verlag was then called, began in 1989. 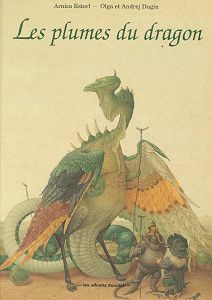 The couple illustrated fairy tales for the Publishers. 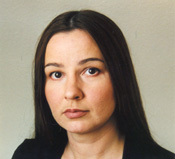 In 1992 Andrej Dugin and Olga Dugina came to Stuttgart, where they still live. In the meantime they are internationally famous – for example they have also received contracts for the decoration of a Harry Potter film and for the illustrations of a book by Madonna. But the Russian couple is still working for the Esslinger Verlag.